Every person on the planet should pause after yesterday's violent attack on humanity’s heritage and understand ISIS’ intent not only to control the future of humankind but also to erase and rewrite our past. not only our future freedom but also our history, the very roots of our civilization. We need civilizing forces now more than ever and must take steps to protect our priceless historical sites and constrict the terrorists' ability to profit from sale of plundered relics. - Encourage all nations to expeditiously implement United Nations Security Council Resolution 2199 passed on February 12, 2015 that prohibits trade in cultural property from Iraq and Syria. (The resolution, passed with full U.S. support, directs that action be taken within 120 days.) Given that the American market is one of the largest, the U.S. can help lead the way by quickly closing our borders to illicit trafficking in conflict antiquities. 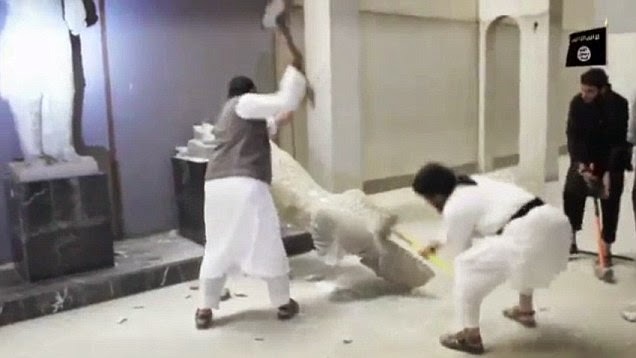 - End impunity for these crimes against heritage which are documented risk factors of impending genocide, crimes against humanity and crimes of war. The International Criminal Court must immediately open an investigation into these severe violations of international law. UNESCO and other organizations have also called upon the ICC to take action.